The year is 1854. Robert E. Lee is Superintendent of West Point, where J.E.B. 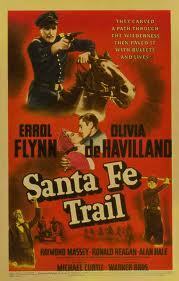 Stuart (Errol Flynn) and George A. Custer (Ronald Reagan) are classmates. In the dormitory, one of the cadets (Van Heflin) reads aloud the secession-promoting pamphlets of abolitionist John Brown. At graduation, the address is given by Secretary of War Jefferson Davis. J.E.B. Stuart and Custer are assigned to the 2nd Cavalry in the Kansas territory, where they have to deal with John Brown.